Do you need a publicist? Maybe so, and maybe no. Come get some hands-on information about the modern role of the PR person, and how that impacts filmmakers today. Brandy Fons is the co-owner of Fons PR along with her husband Ryan Fons. She has over 14 years of experience working in film and entertainment publicity. Brandy began her career in New York, overseeing national brand PR for fashion and beauty clients, including Burt's Bees, Kiehls, and Deborah Lippman Collection before transitioning to film publicity at Barclay Communications where she handled regional publicity for multiple studio clients including Walt Disney Studios, NewLine Cinema, Focus Features, Columbia Pictures, DreamWorks and Universal Studios. She was then recruited by Walt Disney Studios Home Entertainment for the position of publicity manager, where she headed over 500 national PR campaigns yearly for major home video initiatives including Disney classics like Lion King, Snow White & The Seven Dwarfs, Monsters, Inc. and more. Brandy pursued a career as a PR consultant where she continued to consult for Walt Disney Studios as well as theatrical and home video campaigns for Focus Features and Sony Pictures Home Entertainment. Brandy now heads her own PR firm located in Austin, TX where she oversees the publicity of four yearly festivals including Fantastic Fest (the largest genre film festival in the U.S.), ATX Television Festival (a celebration of TV’s past, present and future through screenings and panels), RTX event (a gaming and internet convention hosted in Austin, TX) and Off-Centered Film Festival (Dogfish Head Brewery and Alamo Drafthouse’s annual film/beer festival). In addition, her agency represents the Alamo Drafthouse Cinema chain both corporately and for their national expansion in NYC, Denver, San Francisco, Washington DC, and Kansas City along with their family of companies: Mondo (Alamo Drafthouse’s collectable art division), Fantastic Fest (the largest genre film festival in the U.S.), Badass Digest, Rolling Roadshow, 400 Rabbits, Midnight Cowboy and Drafthouse Films (representing films nationally). Fons PR also represents independent filmmakers, studios (Summit Entertainment, The Weinstein Company), production/creative content studios (Rooster Teeth - Red vs. Blue and Arts+Labor), and Tugg, Inc (a web-platform that enables individuals to choose the films that play in their local theaters). Brandy has a voracious love for her 5yr old daughter Sienna, film, pop-culture, and all things Austin. She could not be more excited to serve as a mentor during SXSW. As founder and president of DAVID MADGAEL & ASSOCIATES, INC, his company continues to specialize in documentaries, independent films, directors, and public affairs issues since 2000. From developing Oscar® campaigns for documentaries to creating film festival strategies for filmmakers and indie films to television broadcast publicity to theatrical release public relations and film unit publicity, the company has become an important entertainment communications firm that boasts a client roster including numerous Academy Award® winning and nominated documentary and short films, Sundance Film Festival Award winners, Toronto International Film Festival standouts, Tribeca Film Festival and South by Southwest gems and independent films, as well as studio projects and television broadcast films for Lionsgate, Paramount, Universal, Sony/Columbia, Variance Films, Zeitgeist, Showtime, HBO, Relativity, Fox Searchlight, Rogue, Focus Features and others. 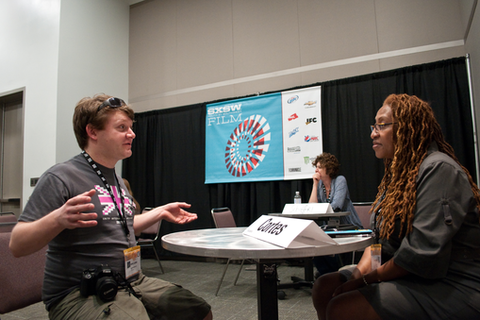 Magdael has been representing films at SXSW Film Festival for over 7 years since 2006. Recent film projects include: BLOOD BROTHER; AMERICAN PROMISE; ESCAPE FROM TOMORROW; A RIVER CHANGES COURSE; CENTRAL PARK FIVE; COMRADE KIM GOES FLYING; BURN; ASAD; KING’S POINT; OUT OF THE CLEAR BLUE SKY; LOVE FREE OR DIE; BIG BOYS GONE BANANAS! *; MANSOME; THE SECRET DISCO REVOLUTION; EVERYBODY HAS A PLAN; 5 BROKEN CAMERAS; IF A TREE FALLS; THE TSUNAMI AND THE CHERRY BLOSSOM; WE ARE LEGION; BEING ELMO: A PUPPETEER’S JOURNEY; THE BLACK POWER MIXTAPE 1967-1975; COMIC-CON EPISODE IV: A FAN’S HOPE; ELITE SQUAD: THE ENEMY WITHIN; THE SECRET IN THEIR EYES; GIVE UP TOMORROW; THE OTHER F WORD; POM WONDERFUL PRESENTS: THE GREATEST MOVIE EVER SOLD; WASTELAND; THE INTERRUPTERS; SEMPER FI: ALWAYS FAITHFUL; SUPERHEROES; LEAVE IT ON THE FLOOR; ADDICTION INCORPORATED; SUPER SIZE ME; WHAT WOULD JESUS BUY; JAM; and others. William Friedkin’s "Cruising"; the eye-opening documentary "Google and the World Brain"; and the Serbian war drama "Circles", recipient of the World Cinema Special Jury Prize. At this year’s SXSW, Mickey is thrilled to be representing Jeffrey Schwarz’s bigger-than-life documentary "I AM DIVINE", a rousing portrait of John Waters’ fearless muse.